Hello again, Miss me ? Sorry about not giving news earlier but these last months were intensive between construction, renovation, gardening and other activities. But I am taking some time to tell you what happened in May. It all started from the end of the previous month, we had two days of Permablitz. Don’t know what is it? Well, it’s usually one day event when you invite friends and volunteers to help you working/creating things. It can be gardening, building houses, rocket stove, reed bed… Anything related to permaculture or implementation of some part of the design. 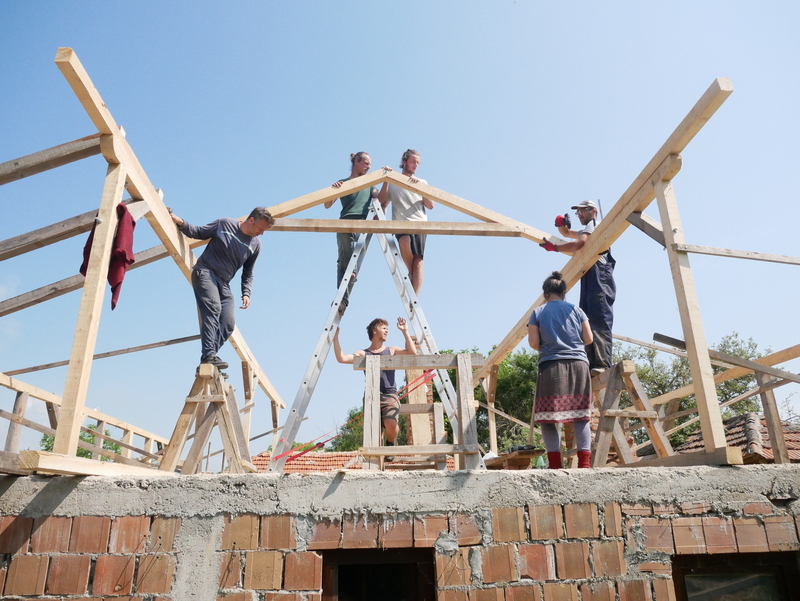 So around 20 people from GAIA’s volunteers and friends came to Bozevce to help us. One group started to think of the future reed bed system (to filter our grey water), another one created compost bins but also planting vegetables and perennials in the garden, making new vegetable bed and also collecting herbs around (like nettle and melissa). Lots of people, lots of fun! Then, the day after the Permablitz we worked on the floor of one room, with a mix of clay and straw, with the help of “Majstor Rogan” coming from Novi Sad. Then we prepared the ground to host “Majstor Bruno”, from Zagreb this time. So we remove the roof tile and all the structure of the roof to raise it up and to be able to use the space under it for future purposes. We are still not sure if we will put back the tiles or create a green roof. Anyway, that was quite tough job during 10 days but lots of fun and learning. I forgot to mention that during this time we had the visit of my parents for 10 days. As I couldn’t do too much, me and my mum were mostly cleaning and preparing meals for the workers. But hopefully my dad was here to help for the construction of the roof and he also finished covering the greenhouse. They brought some French goods (beers, wine, cheese, cookies), binoculars and little tools for carving wood. Link to their Facebook page! 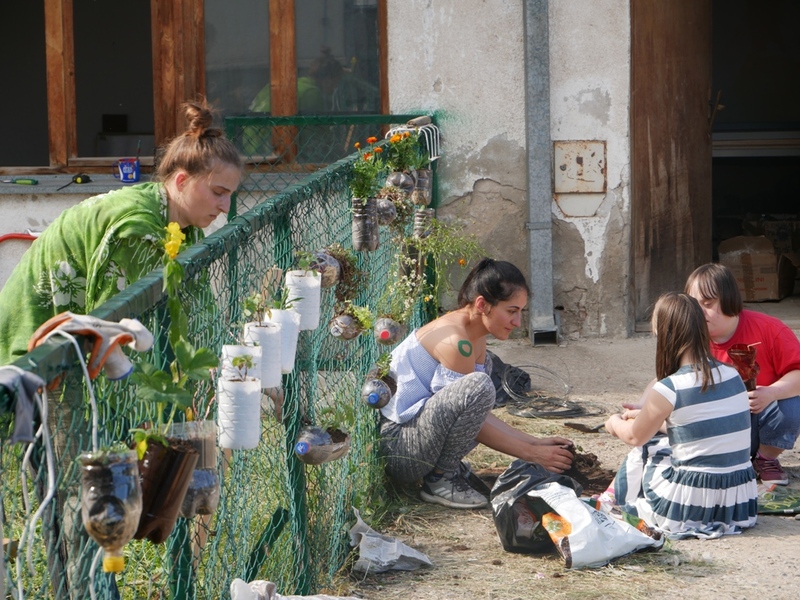 Finally the two last weeks of May was a Youth Exchange organized in Mitrovica (divided city in the north of Kosovo) with the topic of Urban Permaculture. This activity was part of the project 3PEAS, “Permaculture a Path to Peace”. There was 25 young people from 5 countries/organizations (Croatia, Bulgaria, Albania, Serbia, Kosovo) and took place in Down Syndrome Kosova in the south Mitrovica. The idea was to let some space for the participants to learn about parmaculture, to exchange ideas how to turn our cities greener, to implement a garden in the center where the youth exchange took place.